Nick admits that he didn't know where he was, but he does now. He tells Juliette and Wu about the room he saw. Juliette assists Nick to walk, and Wu insists on driving him to the hospital. Adalind tries to get a look at the mysterious laugher, but her blocks her peep hole. Chavez woogs in front of Trubel and confirms that she's the Grimm. She asks Trubel if Nick knows that she's the Grimm. Chavez works for someone high, who would be very interested in her working for them. She tells Chavez that her skills would be very valuable to someone looking to take out dangerous Wesen, that she could have a home among people who knew what she was, and do a lot of good. Chavez apologizes for the tactics she used to obtain Trubel, but she needed to be sure she who she thought she was. Chavez releases Trubel, advising she tell no one for her sake, and theirs. Nick sees his doctor, but the doctor sees nothing that would have caused the blindness and symptoms that he experienced. The doctor suggests that he see an opthamalogist. It's fight night in Portland, the main event is getting ready to begin. A man watches the door as three rough looking men approach. He advises Bobby to not hold back. A fighter gets ready, his coach knows he'll be great. The coach leaves the room as the men enter. Clay asks them not to do what they plan, but they remove their bats, and begin hitting the fighter. He wargs, and beats the crap out of all of them. It's fight time. Clay heads to the ring, as the warm up guys are paid off. Bobby has a broken jaw and he wants more money, he gets it, but the guy paying isn't happy about it. In the ring Clay knocks his opponent out as his momma cheers him on in the crowd. Nick sketches the room that he saw. Juliette thinks its some sort of prison or dungeon, she asks why he would sketch something like that and he's not sure. It's something that they're sure that's connected to Adalind. Nick wishes things were back to normal, but he's not sure what that is anymore. Juliette asks about the picture of Trebel Wu brought over. He's putting the pieces together, and they need to tell him, but Nick's not a Grimm anymore, and he doesn't want to bring him into the Scooby Gang that's now slayerless. Trebel arrives back home, but she doesn't tell them about her weird day, running off to bed. Clay's manager booked him another fight, another kid got hurt, and he wants to throw Clay back in. Coach Abe thinks its too soon, but its only three more fights till they hit the big leagues. Bobby calls, he wants more money or he's going to the commission to get their license yanked. Nick goes through another round of tests. The symptoms he described would have resulted from some sort of trauma to his nerves, but the doctor sees none. His nerves are healthy. The only things she found was an odd level of activity in his Macula. Most people have three cones, some women have four which allows them to see colors invisible to everyone else, Nick has a fourth and possible fifth cone. Nick is a genuine freak. There is some swelling in the area, possibly preventing light from penetrating the cones, but nothing that should be causing pain. Monroe and Rosalee sit down with Hank about Juliette and her desire for him to remain Grimmless. 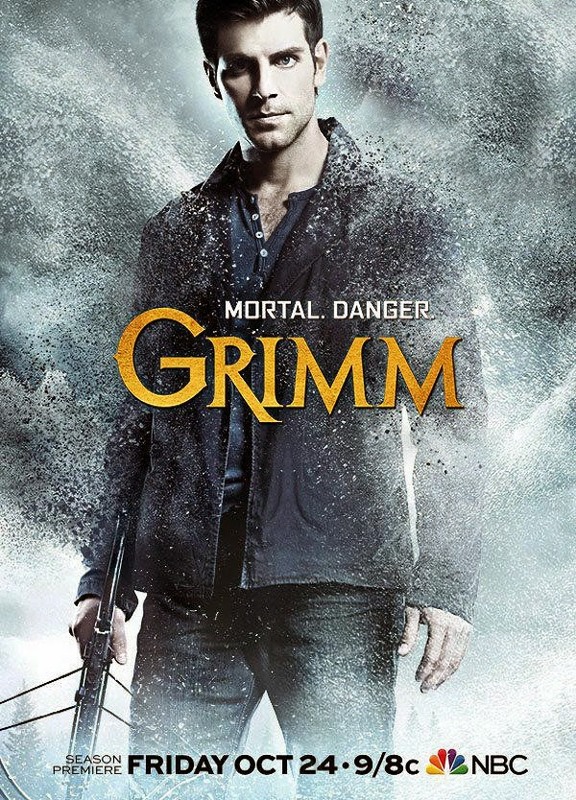 There are many bad Wesen, but few good Grimms. They also worry about the long term effects Adalind's spell will have on Nick. They figure that at the least they should talk to Renard to see where he got the potion. They get a visit from Bud he's babbling as normal. He tells them the talk about the Grimm at the wedding. Hank assures Bud that she's a friend of Nick, and that he has nothing to worry about. Bud thinks that maybe its good having two Grimms, but Rosalee breaks it to him that Nick can't see them anymore. Maybe telling Bud was a bad idea, especially if they want to keep it a secret. Bobby waits in his car for his money, but it doesn't look like he's getting it any time soon. Nick and Hank are on Bobby's murder case. Wu was worried about Nick, but the doctor's said everything was good. Bobby's body was pulled from the river, and the holes in his chest don't look like they came from any bullets. Nick and Hank go to see Bobby's sister. She doesn't know where her brother was, but she tells them that he was pretty banged up the night before. She isn't sure what he was doing there, but he wasn't gambling. He couldn't stay away from boxing, and he was really good at one time, but he took too many hits. Renard tells his mother that he had no choice but to give the baby over to Victor, otherwise she, him, everyone would have been in danger. Elizabeth knows him better than that, and that giving her to the Resistance wouldn't have guaranteed her safety either. His mother asks him if he is going to tell her where the baby really is, having already figured out that she isn't with the Resistance either. He tells her that she is with someone who owes none of the allegiance, and that's all he knows. Monroe and Rosalee arrive, but don't want to interrupt. Renard insists that they talk, and introduces them to his mother. Renard prepares to show them where the potion was made, but Elizabeth insists that he's not well enough. Nick gambled everything to make sure his daughter got to safety, and Renard needs him. Elizabeth offers to go with them. Monroe doesn't want to take her away from her son, but she insists. To beat a hexenbeist like Adalind, they're going to need her. Adalind isn't taking confinement well, and when she goes all bestial, it back fires. Victor had warned her that the dungeon was created for her kind. Nick and Hank arrive to question the manager, Abe and Clay about Bobby Moore. The Manager tells them that Bobby was great, but he was in the game too long. He let Bobby watch the door, and threw some money at him here and there to help him when he could, but nothing more. Bobby worked his shift and left after the fight, and that was the last he saw of him. Nick and Hank leave calling cards. Clay wonders if he hit Bobby too hard, but his manager insist that he didn't do anything Bobby didn't get paid well for. Neither Nick nor Hank really believe the fight promoter. They spot Clay punching a dumpster and both agree that its not normal, even though neither can see him warg. Monroe, Rosalee and Elizabeth arrive at Adalind's storage unit. Elizabeth can immediately smell the spell, but Monroe isn't picking up anything. Elizabeth can pick up traces of Adalind's entire life and her mother's too. Rosalee finds the cauldron, but Elizabeth stops her from touching the hardened contents. Elizabeth cracks the potion, and tastes some of it, turning into Juliette from a moment. She tells them to look for a book that won't open. It's not a riddle, but an actual thing. Nick and Hank pick up Trebel and tell her about the case. They want her to go to the gym, hang up, and work out. Trebel likes boxing gyms she use to sleep in one. Nick gives her a new phone, and makes it clear that she is to merely observe. The boys head to Clay's home to speak to his mother. Clay's mother gushes over her son and his accomplishments. Clay was in all night. Stan has been his manager the entire time, he saw the potential in her son. Abe has been with them the whole time too. Clay's father has not been in the picture, but she knows as Clay gets closer to the big time, the likelyhood of him coming out of the woodwork rises. Wu has located Bobby's car. Can someone give Wu an award for hardest working member on the police force, and reward him with the secret he's desperate to know? Bobby's phone was in the seat, and he called Stan the previous day. Trebel is working out at the gym. She asks Clay for a little help with her gloves. He asks her name, and she tells him Trebel. He wasn't asking her nickname, and she asks his. He doesn't have one, nor does he have a favorite fighter. In truth, Clay doesn't even like boxing, he's in it for the money. Stan spots Trebel chatting up Clay, and he's not happy about it. He sends Clay off to get ready for his fight, and tells Trebel to get lost, but she's not leaving. She paid her money, and she wants to fight. Stan calls over a behemoth of a girl fighter, and gives Trebel the choice to either fight or leave. Abe gloves up Trebel, and Clay notices her getting into the ring as Nick and Hank arrive. Nick specifically told her not to get into any fights, but Trebel never listens. The fight begins, and her opponent is a Wesen. Trebel goes toee to toe with the girl, but she's an amazon and Trebel goes down. Nick wants to stop the fight, but Hank urges him to give her a chance. All eyes are on the ring, and Trebel comes up swinging. She knocks the girl out. She fights dirty, and Stan likes dirty. He plans to have Abe begin training her. Stan jokes with Nick and Hank that if they keep showing up at the gym then they'll have to start paying membership fees. They asks about the call Bobby made, and his alibi for the night. Bobby called about more work, and Stan tells them that he had dinner with Clay after the fight. Clay worries that Nick and Hank suspect him, and that he did kill Bobby. He hit Bobby too many times. Abe is sure that it wasn't is fault. Bobby doesn't want to fight anymore. He begs Abe to tell Stan no more fights. Stan interrupts, scarring Clay. He tells him that as long as they're a team, he'll continue covering for him, otherwise, he'll tell the cops the truth. Stan sends Clay to prepare for the fight, while giving Abe orders to get more guys, better ones, but Abe doesn't want to. Its too much pressure on Clay, but all Stan sees is Clay's rising star, refusing to allow it a slower ascent. Both men warg at eachother and Trebel sees the whole thing as she passes by. She tells Nick, and they head to the trailer to see what they're up against. The voice asks Adalind if she would be happy if he showed her the way out. He claims to know a way. He tells her six stones in, three stones high. Adalind finds the place he speaks of, and pushes the passage open. She crawls into the wall and finds herself in his cell. The wall closes on its own. He lights a candle, and Hoffman introduces himself. He knows that she wants to find her baby. He warns that its a treacherous journey, and that she'll need her strength. He gives her a bite to eat, and then they're off in another of his passages. Rosalee finds a book that cannot be opened, and Monroe gives it a try, marveling over it. Elizabeth is ready to get down to business though. She stabs her palm, bleeding on the book to open it. Elizabeth has found the spell, but she needs a place uncontaminated by a hexenbeist to reverse it. Rosalee offers her the use of the spice shop. Abe gets a visitor, likely his last. Nick, Trebel and Hank look for the beasts from the gym. Trebel points out Stan's beast in Nick's book, it seems to match Bobby's. Hank finds Abe's Wesen. They have a great fighting skill when provoked, but they don't like to fight. Trebel thinks that Clay may be the same with his dislike of the sport. Nick gets a call from Wu that Abe's body has been found. They head to the scene. The cops on the scene conclude that Abe's death was a suicide, but Nick points out that the body has more holes than rebar in it. Hank finds a short suicide note in Abe's pocket, taking the blame for Bobby's death. Nick and Hank plan to pay Stan a visit. Stan's new bully crew get ready to do their job, but Nick and Hank arrive and they run off. Stan accuses them of harassment, but Nick charges him with the death of Bobby and Abe. He tells Stan that he knows that he's Wesen, which he claims to not know what that is, and even what type. Stan wargs but doesn't see any Grimm signs in them, and thinks he's in the clear. Trebel appears behind him, showing that she's a Grimm. He charges her, and Trebel kicks him in the face, but it doesn't keep him down. Nick and Hank go on the offense, but Stan is a lot stronger than he looks. Clay isn't at ringside, and his fight is about to be called for his no show, his mother goes to check on him. Stan is inches from goring Nick and Trebel jumps in. She accidentally on purpose snaps his neck. Nick tells her that their official story is that Stan attacked him, and he did it, she wasn't there. He sends her to tell Clay he doesn't have to fight, as Hank calls in the incident. Clay's mother goes to see her son. He tells her that Stan and Abe are both not there. Clay doesn't want to go and fight, but there' s full house, so many people out there waiting for him. Clay thinks that fighting is killing him. His mother did what she had to, she found him the best people to do what she told them to do. She begins beating at her son, trying to throw him into a rage. Trebel runs in to stop her, telling them that Stan and Abe are dead. Clay's mother sees that Trebel is a Grimm, and she tells her son to kill her before Trebel kills them. Before she can charge Trebel, Nick and Hank arrive, and force her to drop her weapon. Clay doesn't drop his, instead he puts a permanent end to his career, breaking his own arm. Elizabeth translates the spell. She wonders if Adalind understood the risk she made when she cast the spell. She tied herself and Nick together in unknown ways. Monroe and Rosalee begin gathering the ingredients for them to recreate the spell. Outside two men watch the spice shop with some pretty bitchin masks.